Treatment for mesothelioma can be extremely expensive. Surgery, aggressive chemotherapy and radiation therapy may all be necessary to prolong survival. Patients diagnosed with mesothelioma may also face costs associated with pain-management procedures or palliative care and may not be able to work. Health insurance can cover some of these expenses, for those with sufficient coverage, but often insurance policies are not comprehensive enough to provide everything that a mesothelioma patient needs. One recent news article, for example, told the story of a young 33-year-old man who had been diagnosed with mesothelioma and who did not have the money to pay for the necessary treatment. He and his wife had turned to crowd-funding to try to help them to raise as much as $50,000 that they needed to meet their medical expenses. Stories like this are devastating because no mesothelioma patient should be deprived of the treatment needed to save his life simply because of a lack of funding. Mesothelioma is often caused by exposure to asbestos, which may occur on the job. Workers’ compensation claims and legal actions against manufacturers of asbestos can all provide the necessary funds for comprehensive medical treatment. An experienced mesothelioma lawyer in Massachusetts should be consulted by those affected by this cancer for help in determining if they have a claim for benefits. Surgery: Surgery on the lungs can sometimes cure or slow the progression of mesothelioma. Although an estimate of the costs is difficult to obtain because few mesothelioma patients are candidates for surgery, similar lung cancer surgery has an average cost of around $40,000. 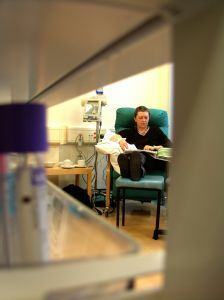 Chemotherapy: It is common for mesothelioma patients to have one or more courses of chemotherapy. Of the 12 drugs that were approved by the Food and Drug Administration for various types of cancer in 2012, 11 of the 12 were reportedly priced above $100,000 for a single year of treatment. Radiation: Radiation therapy costs vary depending upon the number of treatments that are necessary as well as the type of radiation. It is not uncommon for radiation costs to be between $10,000 and $50,000. Patients can also expect to spend large sums of money on pain-management methods, anti-nausea medications and other related expenses. While insurance can cover some or all of these costs, some patients— like the man who was crowd funding his treatment– don’t have health insurance because their medical problems have made it impossible to have a job. Workers’ compensation benefits and claims against asbestos manufacturers can provide asbestos patients with much-needed funds to get the treatment that can help to prolong or save their lives.